Recipe how to make potato cake donuts - donuts is food that is not foreign to our ears.Round and has a hole in the middle of the ring-shaped glance are the hallmark of this food. The donuts are generally made ​​from wheat flour, but there are also giving other variations by adding potatoes to the dough. Then how to make potato donuts? Here recipe how to make the donuts you can do now in the kitchen. Oh yeah, also try a recipe that is not less delicious, the recipe how to make pancakes super simple but delicious. Cut the potatoes into pieces, then boiled until cooked. Enter the flour, sugar, milk powder, yeast, eggs, baking powder and mashed potatoes that had been earlier. Then stir about 20 minutes. Stir the dough using a mixer until smooth half and then let stand for 30 minutes until the dough expands. Avoid mixing yeast, butter, and salt together because it can cause the dough does not swell and seem stiff. Subsequently add salt, butter, and water and stir until completely smooth. Old stirring about 10 minutes. Kalis is a condition in which the dough is not sticky to the touch and supple. But for somewhat different donut dough. 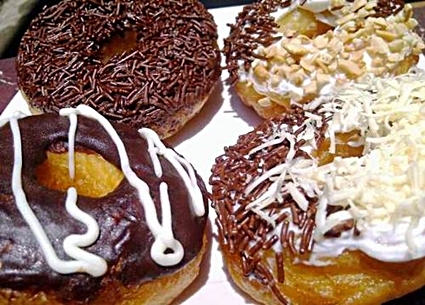 Although it is completely smooth, donut dough remains sticky because there is a mixture of potatoes. Then divide the dough into pieces and let stand for 15 minutes so the dough is really expanding. After that, the dough forms a donut in general that there is a hole in the middle.You can also form a dough according to your taste. Pour the oil into a frying pan, then fry the dough donut in a low heat until the color turns brown. Use tools such as chopsticks when frying donuts in order to get a perfect circle in the donut hole. For good results, fried in a small fire with a lot of oil that donuts sank half and the bottom does not touch the bottom of a frying pan. Sliced ​​into small pieces using a knife chocolate beforehand. Enter two tablespoons margarine and chocolate which have been sliced ​​into small pieces had to nonstick skillet and cook until melted. Do not forget to turn off the fire, because melt the chocolate with the fire burning conditions can make the chocolate taste so charred. Dip the top side of the donut into the liquid chocolate before, and then sprinkle meses on it.